Brainy Girls! : Three Down, Two to Go! We've covered three of the five senses: smell (perfume science), hearing (interview with conductor Dijana Ihas), and taste (entomophagy), which leaves only touch and sight left! I have some ideas for you, but let me know NOW if there's anything in particular you want to know about with regards to touch and sight! The holidays are approaching and I will try to get these articles done, but I'll have to keep my fingers crossed. Even Brainy Girls need to do holiday shopping! And since we've been posting so much about insects on Facebook lately, here's a fun image for you. 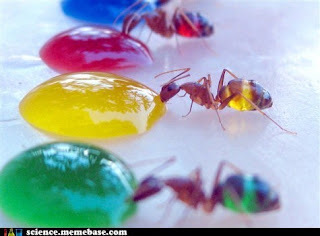 The photographer's wife noticed that the sugar ants have transparent abdomens that turn the color of the fluid that they drink! You can see more of this photographer's work with colored ants here. Have a great weekend!